1979 heralded the emerging of a new star on the Canadian swimming scene. He made his first appearance in the TAG rankings during the short course season and, by the end of the long course season had progressed to be ranked first in Canada in the 100m backstroke for 13&14 boys. In the same year, at age fourteen, he won the 100m backstroke at the Eastern Division II Championships in Montreal. In 1981, Mike won the first of many medals at a national championship and throughout the next seven years, he amassed fifteen gold, five silver and two bronze national medals. Also in 1981, he represented Canada at Heidelberg in a tri-meet with the Federal German Republic and Russia. It was here that he set his first Canadian record in the 100m backstroke. 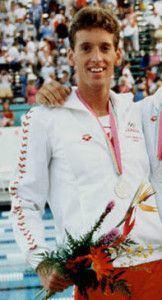 Between 1981 and 1986, Mike set a total of fourteen Canadian records, including a World Best time in the 200m backstroke at the 1984 National Short Course Championship. From 1981 until 1986, he represented Canada at every international competition, earning two gold, four silver and seven bronze medals. In 1982, Mike West won a gold medal in the 100m backstroke and a bronze medal in the 200m backstroke at the Commonwealth Games in Brisbane, Australia. He also swam the backstroke leg of the medley relay team that led the race from start to finish, but later disqualified. In 1983, Mike attended the FISU Games in Edmonton, Alberta. After winning gold and bronze medals against two highly ranked Russians, Mike finally realized he was a world class backstroker. At the 1984 Olympic Games in Los Angeles, Mike highlighted his career on an individual basis with a bronze medal in the 100m backstroke and a silver medal in the 4 x 100m medley relay. The latter was particularly satisfying because they defeated the Australian team to avenge their loss by disqualification two years earlier. Mike’s career ended in Madrid in 1986 at the World Championships. His many qualities as both a swimmer and a person were recognized when he was named captain of the Men’s Team.